Rhonda Woodroff, center left, sister of Quintus Crews and executor of his estate, presents SAU President Dr. David Rankin with a check for $68,000. Also pictured are Josh Kee and Jeanie Bismark of the SAU Foundation. Quintus Crews was a legendary figure in south Arkansas college athletics during his career. A Mulerider football player in the 1950s, he later went on to coach at Ouachita Baptist University and the University of Arkansas at Monticello. He passed away on Dec. 5, 2009, at age 77, but his legacy will live on at Southern Arkansas University after a $68,000 bequest from his estate was presented to University officials this week. 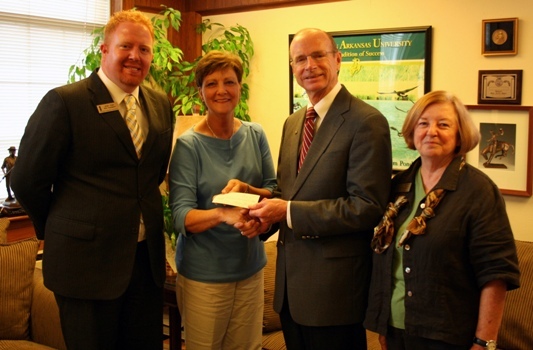 The gift will fund an endowed scholarship in Crews’ name through the Southern Arkansas University Foundation. The scholarship created with the Crews bequest will be available to students who demonstrate financial need, regardless of academic major. 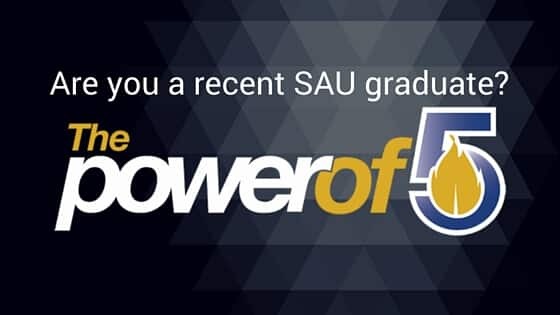 Crews had previously funded a scholarship for a student in the College of Business and was a faithful supporter of the athletic programs at SAU. A native of De Queen, Crews played all sports in high school and achieved All-State status in football. After high school, he attended Southern State College (now SAU) where he played football for Coach Elmer Smith during the Muleriders’ 1951 and 1952 seasons. He later transferred to Arkansas A&M (now UAM) where he earned All-AIC and All-American honors in 1955. After graduating from college, he attended officer’s training for the United States Marine Corps and was commissioned as lieutenant. With an honorable discharge, he returned to Arkansas and began coaching in 1967. After coaching at OBU and UAM, he retired to Prescott where he owned and operated Baker’s Easy Pay Store until 2007.